Objectives: Extraction and manipulation of bacterial nucleic acid directly from soil has emerged as indispensable technique to explore the genomic potential of uncultured microbes. Major difficulty in separating humic acid from soil DNA is attributed to its strong interactions with the humic acid. Previously several methods were used to purify DNA, however the kits and material used during purification is costly and lack efficieny also. 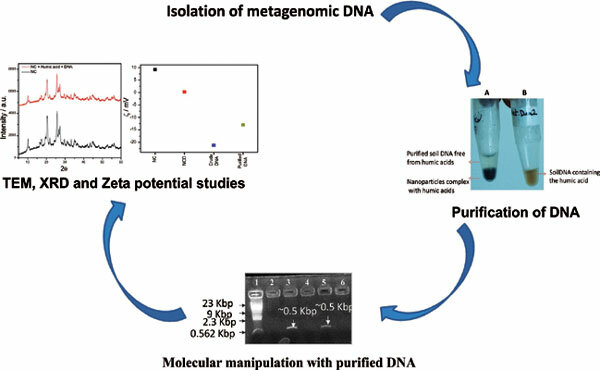 This study reports a cost effective, reliable and time saving method for the purification of metagenomic DNA based on novel Nanocomposite. Methods: Nanocomposite TiO2-PANI-SbSnP (Titanium dioxide-polyaniline Tin (1V) antimonophosphate) was prepared by introducing the SnSbP gel into the green gel of PANI followed by addition of 30 mg of TiO2 nanoparticles. TEM, XRD and Zeta potential studies were carried out to gain further insights about the mechanisms underlying the purification, we carried out the following studies. Results: Nanocomposite showed size ~5nm as validated from TEM images. It was positively charged as evinced from its zeta potential value (+9.2mv) and binds strongly with humic acid.It is capable of removing ~98% of the humic acid. Time dependent restriction digestion of the purified and non-purified DNA revealed that nanocomposite purified DNA was easily digestible with restriction enzyme. Purified DNA also led to PCR amplification of the 16S rRNA employing universal set of primer 27F and 1642 R. In contrary, the non-purified DNA was neither digested nor got amplified. Thus, the synthesized nanocomposite demonstrated its potential application in removing impurities from soil DNA. Metagenomic, nanocomposite, purification, transmission electron microscopy, zeta potential, DNA.